weather eye. 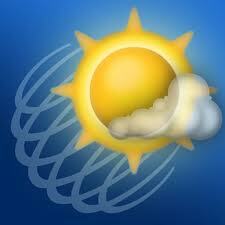 n. An ability to recognize quickly signs of changes in the weather. Idiom: keep a/one’s weather eye open. To keep watch; stay alert. Having a weather eye is apropos for biking no matter which meaning you use. We need to stay alert and we need to pay attention to the weather. My skill at both has improved thanks to riding my bike. 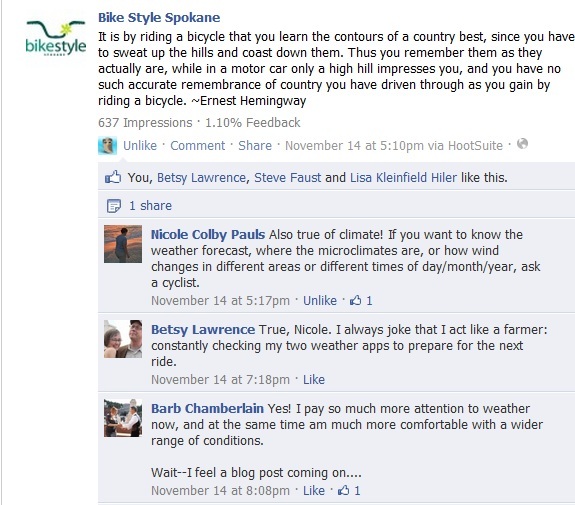 Comments on facebook.com/BikeStyleSpokane about weather. I’ve come to appreciate weather a great deal more thanks to riding. I pay attention to it in a way I never did when its effect was only going to touch me directly between front door and car door. I check the forecast but I don’t solely rely on it. I use my “weather eye” to gauge the skies, the wind, and the road. This past week when meteorologists were forecasting a snow dump Wednesday night—and again Thursday when it didn’t happen Wednesday because, surprise! they’re sometimes wrong—I looked at the conditions and chose to ride. It just didn’t look bad enough to duck and cover. I was right on. I rode in cold but definitely manageable conditions, and the snow didn’t really dump until Friday night. We got a little snowfall Thursday night. Friday morning the snow was reduced to slush and bare, mostly wet roads where the vehicle tires had worn the snow away. I rode cautiously because of the touch of frost on side streets and used my “weather eye” to stay alert for drivers who were blithely ignoring said frost, but I didn’t let the conditions push me off the bike. That’s the second weather effect of riding regularly that I particularly appreciate. Not only am I better able to assess what’s really happening around me, but I’m also less bothered by it. I don’t mind being a little damp or cold. As I mentioned in a post on barriers to biking as perceived by those who don’t bike, many are willing to put up with far worse conditions in the name of recreation. I’ve always said I loved having four seasons. What I really meant was that I loved the perfect exemplar days of each season: mild, budding spring; clear, warm (but not too hot!) 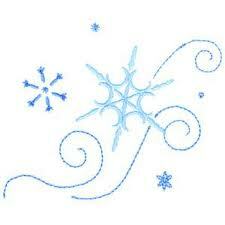 summer; crisp, glorious, sunny fall days; beautiful winter wonderlands with sparkles glinting off the drifts. Note that my description pretty much counts on sunshine. I didn’t really appreciate the seasons. I didn’t fully recognize the shift that makes 50 degrees in spring a different, warmer 50 than the 50 degrees I rode through last week as we shifted from fall toward winter. In my era BB (Before Biking), I thought about seasonal clothing changes more in terms of closet organization and what I wore inside the office—Is it time for bare legs yet? 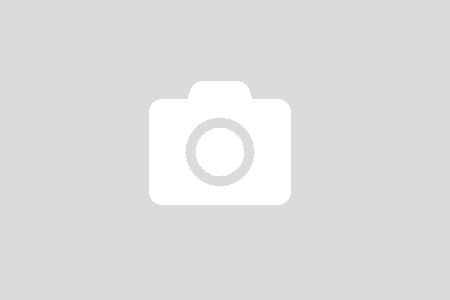 When do I put away the sweaters?—than in terms of what the clothing did in a practical sense to provide the appropriate amount of heating, cooling, ventilation, and water protection. Now that I’ve shifted my clothes-shopping decision-making filters, I suppose I appreciate my clothes more, too. I’m not saying I’m crazy and I’ll ride through tornados like Miss Almira Gulch (although, come to think of it, she did make it….). But I’ll accept—and even enjoy—a far wider range of weather conditions because they’re riding conditions. A day I can ride my bike is always a day with good weather. What attitude or attention shifts have you noticed as a result of riding? Previous post: Baby, It’s Cold Outside! How do you handle hills in the rain and slush, aside from just going slower? I’ve got a couple of steep downhills (one an actual hill, the other is a ramp for the bike trail’s bridge over a highway) on my commute to work and I’ve been terrified to try those in the wet. I suppose I could just walk my bike down, but do you have any other tips and tricks? Yeah, slush especially. I’ve heard of too many folks getting seriously injured in traffic to take on slush. The space i have for riding disappears when slush sits on the road. Unfortunately, slush keeps me in the car cage….